Images courtesy of the Ling family. 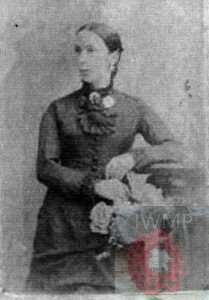 Died: 5th July 1920; age 35; Multiple Abscess in brain & Compression at the East Suffolk Hospital, Ipswich. Residence: 17, Silent Street, Ipswich. Occupation: Furnace man – Foundry. Ellis had served eight years in the Army Service Corps before the war. 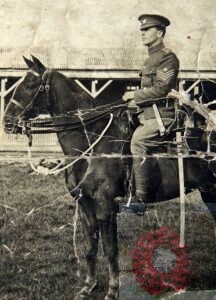 He rejoined on August 4th, 1914, and proceeded to France, where he served nineteen months, after which he was sent Salonika, and was invalided home to Bristol in 1916. After recovering, he went to Malta. Date of Entry Therein: 20th September 1914. Demobilised in September 1919. Relatives Notified & Address: Husband of N. Smy (formerly Bergdahl), of 17, Silent Street, Ipswich. Step Brother to GEORGE BERNARD BERGDAHL. kia. 1891 45, Priory Street, Ipswich. 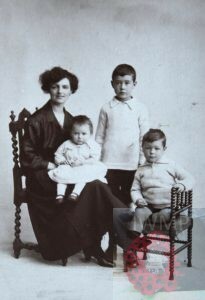 Ellis was 6 years old and living with his widowed mother & half brothers. Rebecca Bergdahl (nee Whybrow), 38, Living on her Own Means, born Ipswich. Eric William Arvid Bergdahl, 13, born Gällivare, Norrbotton, Sweden. George Bernhard Bergdahl, 12, born Gällivare, Norrbotton, Sweden. 17, Handford Road, Ipswich. Ellis was 17 years old, a Soldier – Suffolk Militia. He was living with his mother, cousin and mother’s husband & step sister. 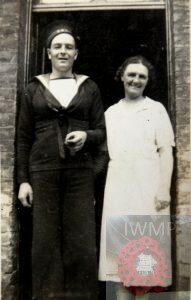 John Patrick Doole, 39, Navy, born Ipswich. Rebecca, 48. Frederick Whybrow, 17, a Soldier – Suffolk Militia. Daisy Winifred Whybrow, 9, born Ipswich. 3, Turret Buildings, Turret Lane, Ipswich. 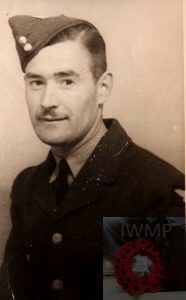 Ellis was 27 years old, a Vanman – Laundryman. He was Head of the Household, his mother was living with him. Rebecca, 58, a Charwoman – Office. 1 boarder. 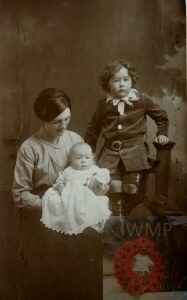 In 1911, Ipswich, Ellis married Nellie Hannah H. Adams, born 1890. They had 3 children: Leonard Ellis George Bergdahl, born April 1913, Ipswich. Reginald H. Bergdahl, born October 1916, Ipswich. Olive Bergdahl, born March 1919, Ipswich. On Friday afternoon the funeral took place at Ipswich Cemetery of the late Bro. E.G. Bergdahl, R.A.O.B. 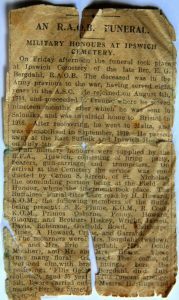 The deceased was in the Army previous to the war, having served eight years in the A.S.C. 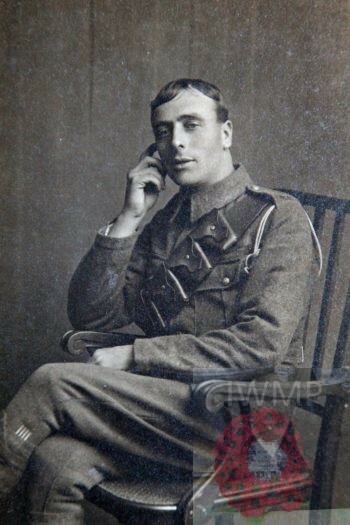 He rejoined on August 4th, 19143, and proceeded to France, where he served nineteen months, after which he was sent Salonika, and was invalided home to Bristol in 1916. 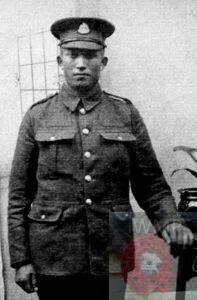 After recovering, he went to Malta, and was demobilised in September 1919. He passed away at the East Suffolk and Ipswich Hospital on July 5th. Full military honours were supplied by the R.F.A., Ipswich, consisting of firing party, bearers, gun-carriage, and trumpeters. On arrival at the Cemetery the service was conducted by Canon S. Green, of St. Nicholas, the concluding portion being at the Field of Honour, where the interment took place. The Buffaloes’ burial rites were read by H. Howard, K.O.M., the following members of the Buffs being present: S.E. Plume, K.O.M., R.Cook, K.O.M., Primos Osborne, Penny, Howard Glading, and Brothers Hiskey, Wright, Jarrett, Davis, Robinson, Godbold, Bowd, Calthorpe, Hines, A. Howard, Crane, and Garrard. The mourners were: Mrs. Bergdahl (widow), Mr. and Mrs. Eric Bergdahl, Mrs. Doole (mother), and Mr. and Mrs. Hearn. The coffin, of polished elm, with brass fittings, bore the following: “Ellis George Bergdahl, died July 5th, 1920, aged 35 years.” The funeral arrangements were carried out by Messrs. Hastings and Son, of Berners Street. The Royal Army Service Corps (RASC) responsible for land, coastal and lake transport; air dispatch; supply of food, water, fuel, and general domestic stores such as clothing, furniture and stationery (but not ammunition and military and technical equipment, administration of barracks; the Army Fire Service; and provision of staff clerks to headquarters units.